The Goodwin family had built the bones of an epic treehouse on Kauai: multiple platforms shot into the sky, forming sheltered lanais with incredible views of the lush canopy. 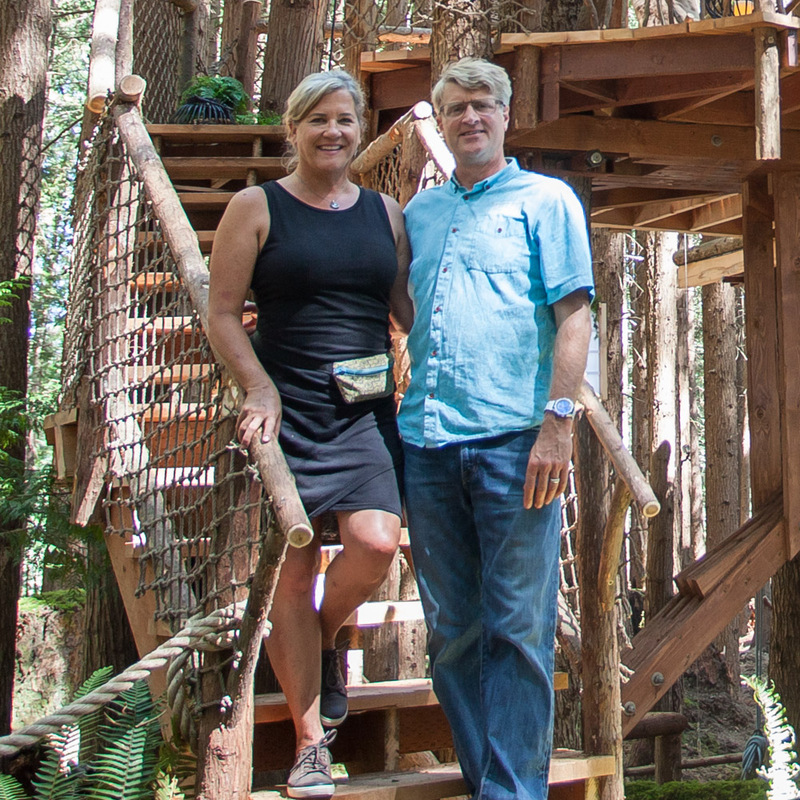 We were honored to help transform this foundation into the Goodwins' dream treehouse, making a few updates for safety and adding a sky-high crow's nest to take it over the top. 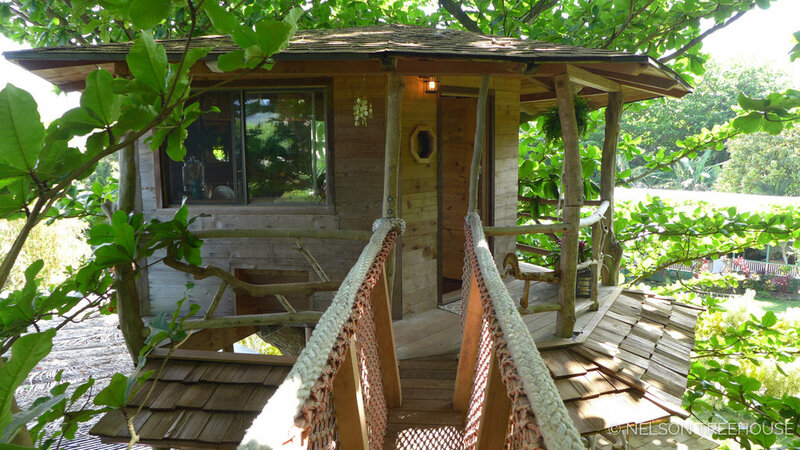 We had the privilege of spending a month in Kauai this past spring, working on this treehouse and the Oceanside Oasis. Mahalo nui loa to all the friends we met there for welcoming us to the island. Our departure from Kauai came just before the devastating floods—we were so saddened to hear of the destruction and send our best wishes to all those affected. A raised deck leads to the first platform. The treehouse roosts in two false kamani trees (also known as tropical almond trees). 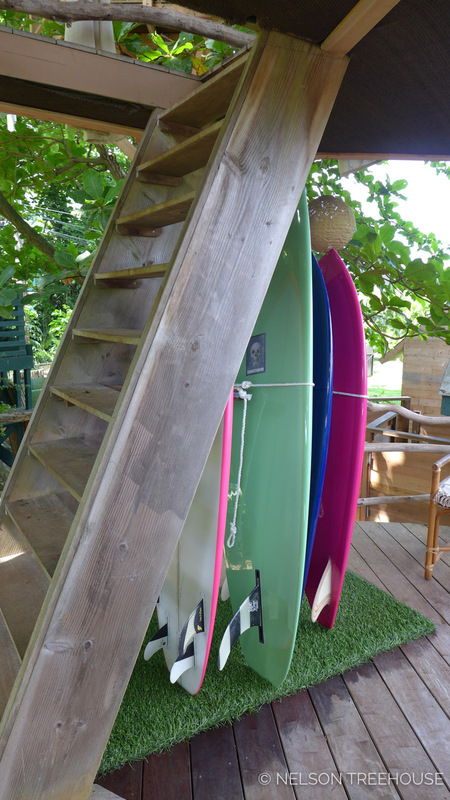 The Goodwins are avid surfers, so it only makes sense that their treehouse has ample storage for boards. 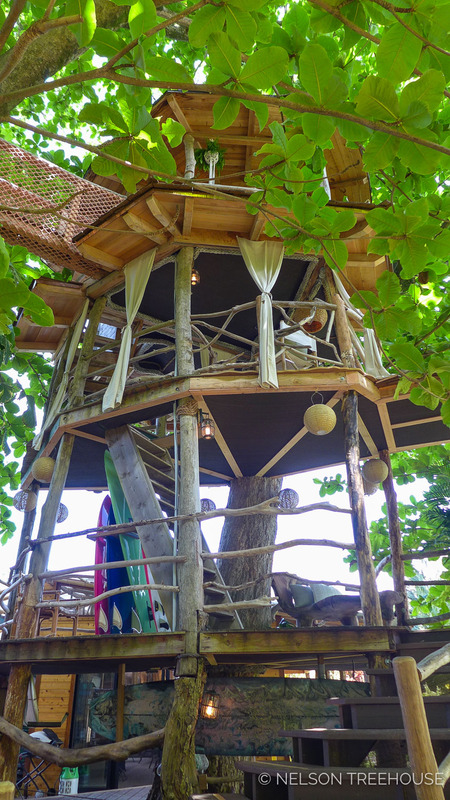 With its ships ladders, towering height, and multiple open-air platforms, the treehouse looks like it came to life from Swiss Family Robinson! The first landing holds an airy seating area. Updates included added railings around each platform, extending rooflines to provide more shelter from rain, and building the catwalk to the bedroom. Inside the bedroom, large windows bring in lots of natural light and offer panoramic views of the canopy. Built-in storage is key for small spaces like treehouses. These false kamanis are truly spectacular. Sections of them were covered in vines that our crew was careful to disturb as little as possible during construction. The crow's nest soars 60 feet from the ground! Four platforms connected with three ship ladders make up this towering viewpoint. 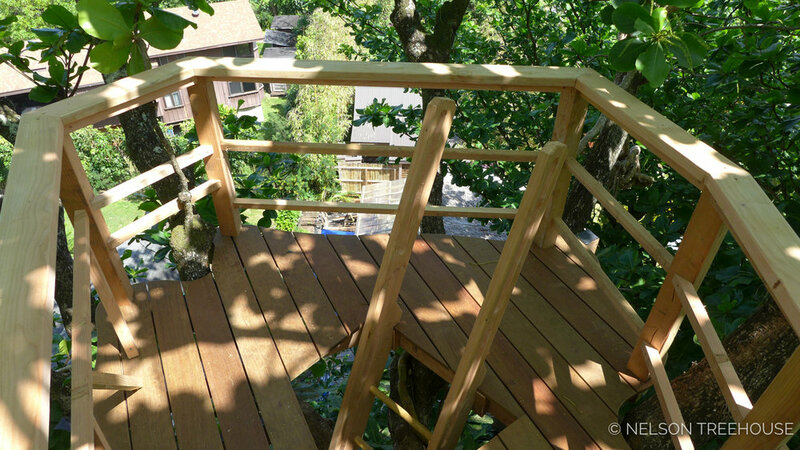 Our crew used ironwood as decking for its natural weather resistance. From here, you can see all the way from the mountains to the ocean. Thanks for taking a closer look! Mahalo, Goodwin family, for having us for this special build. We wish you a lifetime of joy up in the trees!